I recently moved into a new house in Bellingham, WA and have started to paint the bedrooms. Being an organized guy I brought up my painting supplies and laid them out on the floor. I then made a list in Note Pad on what supplies I needed to buy. Often when I am making quick, on the spot and temporary list, I find the freehand use of the Note Pad faster and easier than writing a Memo. Once I had the list done I took a picture of what I had. I do this because I will often be in the store and see an item and say “Hmm, do I have one of those?” and the picture will remind me of what I currently have. When I get to the store I’ll then open my list and as I add the item to the cart I will draw a line through it. When all the items are crossed off, I’m ready to pay. The nice part of having the Note Pad open during this process is that I can jot down something that I might want to buy but not sure until I get home to see if there is a real need or not. If not, I cross it off, if yes, I leave it on the list for my next visit to the paint store. And there is always another visit to the paint store. Now if I could only get my Zire to actually paint the room. This evening I met with Darrin in Lynden. Darrin is a writer who will be helping me with various editing and writing tasks. For the meeting I printed out a hard copy of his contract, directions on how to access the FTP site, an outline of work that I needed help on, and ideas that I had for my next newsletter. I only needed to print out one copy as I had copies of all the documents on my Palm. This was very convenient and demonstrated the power of the Palm. We quickly worked up some additional ideas of which I jotted down on my Palm and then copied back to my PC. After the meeting I met my wife for dinner. If I would have brought my laptop to the meeting I would of have worried about leaving it in the car during dinner plus the laptop would have been overkill for what I needed for this quick ½ hour meeting. Here’s how. Try any version of Word Monaco (Palm, Pocket PC, Treo, Windows XP / 98) and then go to our forum (the link is below) and post your opinion about the game. The first 5 posts will get a copy of the game – no charge – and 5 more winners will be randomly picked. Make sure to register so we have your name and email address on record. Contest ends February 11, 2007 at 11:59 PM Pacific Time. 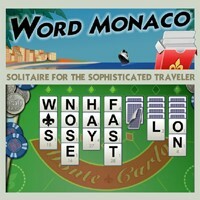 The Pocket PC version of Word Monaco has arrived to take you away. It’s our new and unique twist on the game of Solitaire by using letters instead of numbers. Whether you have a PC, Palm, Treo 650/680/700/750, or any other Windows Mobile device, we have the game for you. With nine difficulty levels, settle in for whatever type of challenge you’re in the mood for. Mac users… stay tuned!